Your body is a unique work of art. another body just like yours. Learn to love it and it will love you back. As a young woman Pat Ballard almost died trying to starve her body into a societally approved size. 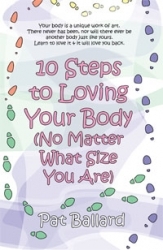 In 10 Steps to Loving Your Body (No Matter What Size You Are) she shares the steps she created―and took―to heal the damage of years of dieting. Join her in celebrating size diversity, self esteem, positive body image, and health at every size. and I have never felt better about myself! Thank you, thank you, thank you!" "...a mixture of personal coach and cheerleader for anyone looking to discover how to accept their body as it is, not as you want it to be. 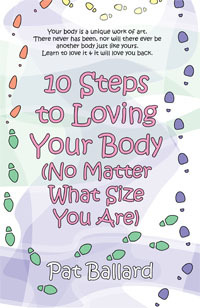 Complete with guidelines and worksheets, this book is aimed to help you stop fighting with your body." "I have been a fan of Pat Ballard's writing, and her vision, for years. If you haven't learned to cherish your life's vehicle―your body―this beautiful little book will make a big beautiful difference. If you already know what is truly important, this book will re-arm you for the sometimes daunting task of living fully at any size." "With her wit and wisdom, Pat shares the secrets to eliminating self-loathing. This effervescent book lifts a woman's spirits and toasts life as it should be lived!" "If you're a woman, odds are you're not happy with your body. You probably can't remember when you weren't at war with your belly or your thighs. (Men are beginning to catch up with their own versions of body discontent.) Western culture provides you with a steady stream of images and advice about an often unattainable "right" way to look, feeding your feelings that you just aren't acceptable as you are. "10 Steps is your body's best friend in pocket form. I'm delighted to have it on hand to recommend―personally and professionally―to anyone struggling with body image and the inkling that it's better to embrace than fight the one-and-only body you have."